Please enjoy this reblogged post from Pocket Perspectives! It blew me away and does so much to fill out what I want to accomplish on the critterly journey we are on here. Ripple away, okay? a slide show presentation of those images…. 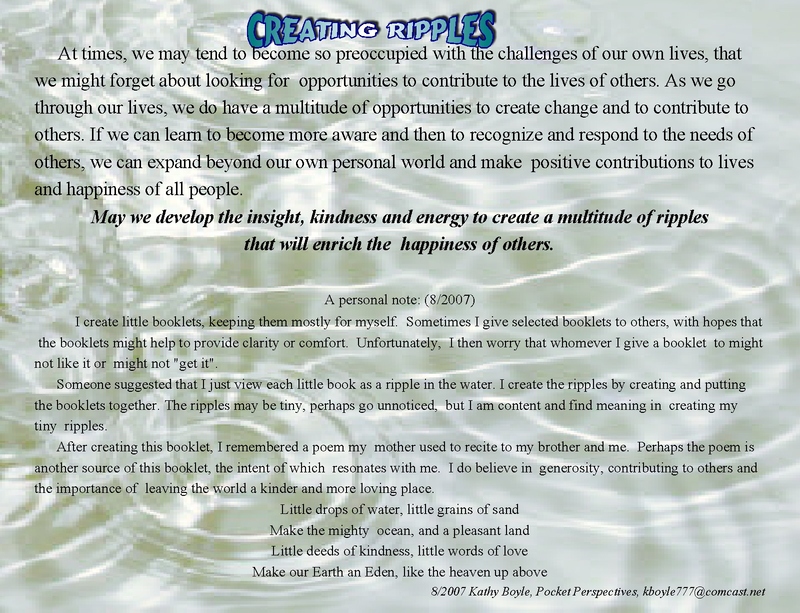 An added note…..Saturday is my brother’s birthday…may he feel safe and happy, nurtured and protected…may those who are able to create ripples direct them that way…may we all create ripples in our own and other people’s lives. Washing away down the mountain to flood away those mean old goblins and bog folks we are, indeed, dear willowdot! Jane, bless your dear, sweet heart! Beautiful blogger am I? All due to HIS grace! And you guys make it so very easy for me to be “beautiful” here online! 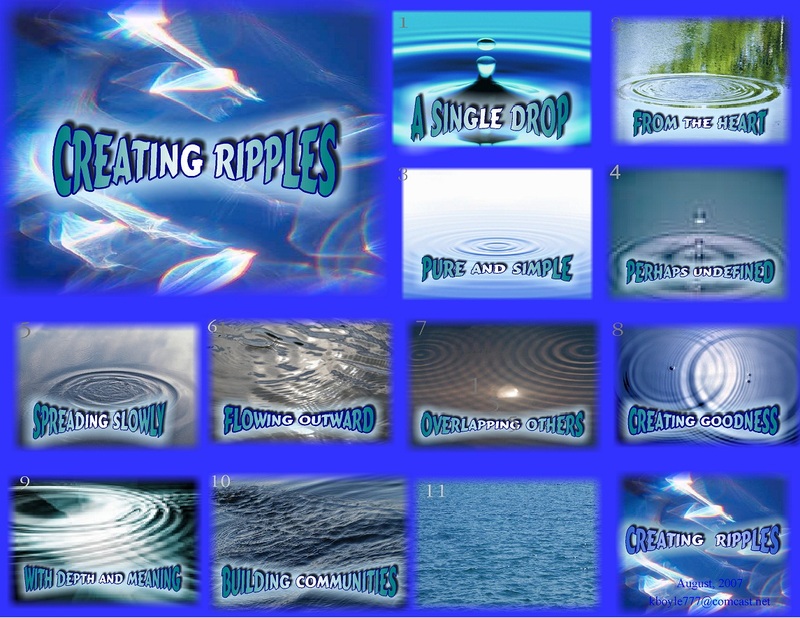 Dearest nightshade130, it was certainly my pleasure to share these “ripples” with you all! I hope you will continue to visit Pocket Perspectives. I have gained much wonderful spiritual insight there! God bless you double, my dear sister in the Lord! each of us are a Pebble Granbee, each causing our own ripple effect.. I have this written upon my own Gravatar logo image..
“”As the effect of a seemingly insignificant word passes from person to person, its impact grows and can become a source of great joy, inspiration, anxiety, or pain. 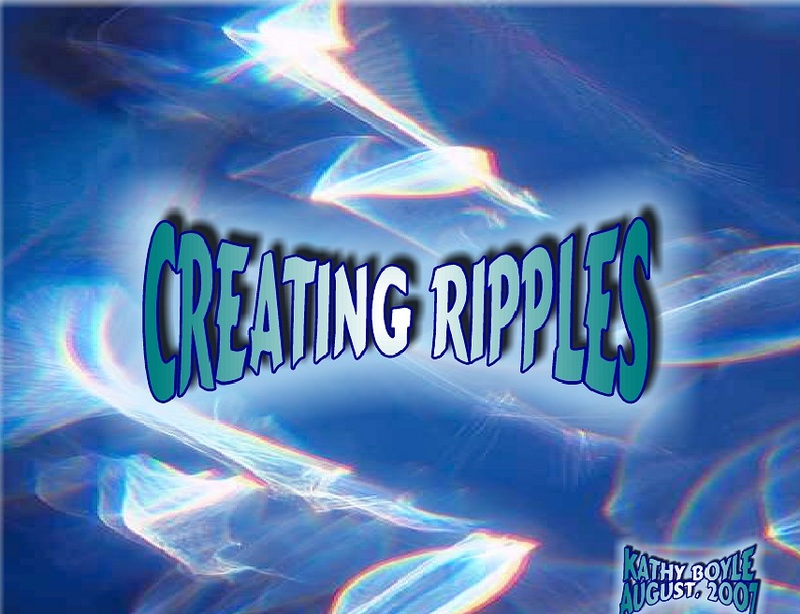 Your thoughts and actions are like stones dropped into still waters, causing ripples to spread and expand as they move outward.. Yes, dear Sue–let us absolutely be as one in causing tremendous ripples to spread light and peace and love in our world! Thank you so much for your very thoughtful comments and your reminder about your pebble log on your gravatar! eof737, it certainly IS always beautiful when our love and empathy and kindness and help send ripples out all around us! Pleased to know this peaked your interest, Coco! Glad I included it, therefore! Thanks for the feedback!